Thanks for all the sympathy, support, and slack-picking-up while I was going through all these less-than-pleasant procedures. I truly appreciate it! 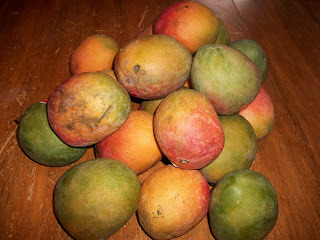 Last week I ordered two boxes of mangoes from Bountiful Baskets. They're finally ripe, so I'm going to cut them into cubes and freeze them, but I need some more ideas of what to do with mangoes. Smoothies are a crowd favorite around here and I need to look for a canning recipe for mango salsa, but any other thoughts? This past week I went on another movie-watching tear, this time all checked out from the library. I watched a documentary called Forgiving Dr. Mengele that was recommended to me by a friend after she read my recent post on forgiveness. (I'm working on another, so I'll talk about my thoughts on the film then.) I also watched three feature films: Contagion. The Best Exotic Marigold Hotel, and the classic All About Eve. I'm now fanatically paranoid about washing my hands and not touching my face, I desperately want to visit India, and I'm in awe of Bette Davis. And all three of those movies met the Bechdel Test! Good week for movies! "Mass media entertainment doesn't just reflect our culture; it also works to create it. Sexist jokes in particular serve as a form of cultural permission, which help entrench toxic preexisting attitudes and opinions." "Now I’m certainly not arguing that all stories must include completely fearless, hyper-individualistic, heroic women who pull themselves up by their bootstraps and never need anything from anyone. Of course, there is absolutely nothing wrong with offering or occasionally needing assistance. The human impulse to help others in need is certainly not a negative thing. It only becomes a problem when acts of altruism are repeatedly presented in heavily gendered ways that are bound up in harmful myths about women as perpetual victims and men as paternalistic saviors." I love the thought experiment "The Legend of the Last Princess" (the intro for it starts at about 19:00). Here's hoping somebody makes that game! You can always make 'fresh' mango salsa with the frozen mango chunks. Most of the canned mango salsa recipes more or less add mango chunks to a regular tomato-based salsa recipe -- not my favorite. If I'm gonna have mango salsa, I want MANGO salsa, darn it!